Please join us for at the 7th annual Moonlight Masquerade! This annual cocktail and fundraising event is hosted by the Junior League of Northwest Arkansas to benefit our community impact focus of UNMASKING domestic violence in Northwest Arkansas. Cocktail attire, festive mask and/or theatrical hair & makeup are strongly encouraged! Interested in sponsorship opportunities? 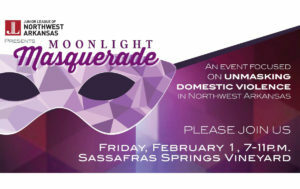 Please email moonlight@juniorleaguenwa.org for more information on the 7th Annual Moonlight Masquerade event. Follow event updates on our JLNWA FB Page and Moonlight Masquerade Event Page.